Can you confirm these amateur observations of Aspidoscelis gularis? Type locality: Indianola and the Valley of the Rio Grande del Norte. Restricted to mouth of Devils River, Texas by SMITH & TAYLOR 1950.
meeki: Type locality: Mexico: Garza Valdez, Tamaulipas; S. E. Meek; 1903.
septemvittata: USA (Texas), Mexico (Chihuahua, Coahuila; Type locality: “El Dorado County, California” (in error). Restricted to Marfa, Presidio County, Texas (fide SMITH & TAYLOR 1950). Reproduction Oviparous. Bisexual species. Forstner et al. (1998) present evidence that Cnemidophorus septemvittatus and C. gularis hybridize in nature. However, they still recommend to consider both species as valid due to recognizable phenotypic differences. Aspidoscelis gularis also hybridizes with Aspidoscelis laredoensis. Comment Synonymy mainly after SMITH & TAYLOR 1950. Subspecies after LINER 1994. The status of Cnemidophorus gularis rauni and C. g. semiannulatus WALKER 1967 remain unclear. These subspecies have been erected in Walker’s thesis but we have seen only the Dissertation abstract which doesn’t have much detail and no type information. Forstner et al. (1998) present evidence that Cnemidophorus septemvittatus and C. gularis hybridize in nature. However, they still recommend to consider both species as valid due to recognizable phenotypic differences. See also discussion in CROTHER 2000 and TAYLOR et al. 2012. Distribution: Neill & Allen 1959 reported this species from British Honduras (Belize). Not in Yucatan state (Mexico) according to GONZÁLEZ-SÁNCHEZ et al. 2017. Etymology The specific epithet, gularis, is derived from the Latin word gula, meaning "throat," probably in reference to the bright coloration of the throat in males (Lemos-Espinal & Dixon 2013). Duellman, W. E., & ZWEIFEL, R. G. 1962. 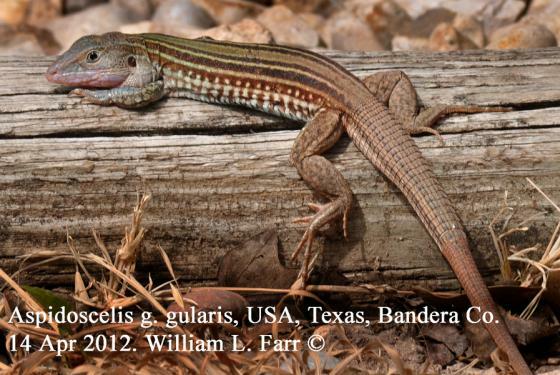 A synopsis of the lizards of the sexlineatus group (genus Cnemidophorus). Bull. Amer. Mus. Nat. Hist. 123: 155-210. Wright, J.W. 1993. Evolution of the lizards of the genus Cnemidophorus. In: Wright,J.W. & Vitt,L.J. (eds.) Biology of Whiptail lizards (genus Cnemidophorus), pp. 27-81. Oklahoma Mus. Nat. Hist., Norman.